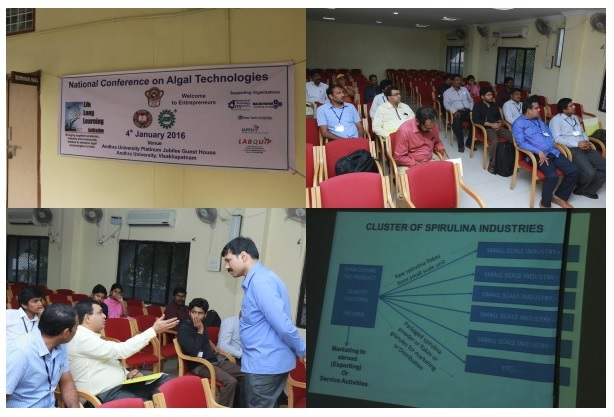 The Sevas Centre for Sustainable Rural Technologies (SCSRT) is an initiative by the group of Entrepreneurs/Farmers/Experts/Scientists joined in the first Entrepreneurs meeting held on 4th January 2016, in the National Conference on Algal Technologies, Visakhapatnam, Andhra Pradesh, India. SCSRT aims to promote advanced rural technologies for sustainable development of villages. As a first step towards sustainable development, the members have decided to start four centre’s throughout Southern India to promote rural technologies. Initially, the aim of the centre was confined to offer student projects, training, technology development and collaborations. The members attended that important meeting includes, Mr. Rajeshkumar Kansagara, CEO, Himani Shipping Services Pvt. Ltd. 8, Madhav Park, L.P. Savani Main Road, Adajan, Surat, Gujarat, Mr. S. S. Jiban Dash, Chairman, Gugly Centre for Biological Research, Odisha, India, Prof. Dr. S. Rajkumar Immanuel, Department of Botany, The American College Madurai, Tamil Nadu, Mr. J.R.Parhi, Vikash Dhara (NGO), Kotapur, Jajpur, Odisha, Mr. Randeep Reddy, Lawyer and Entrepreneur, Hyderabad, Andhra Pradesh, Mr. Santosh B, Advisory Member, Sevas Educational Society, Hyderabad, Andhra Pradesh, Mr. Nazimdhine Aly, M.Tech (Biotech), National Institute of Technology Rourkela; Odisha India, Mr. Pola Arun Kumar, Lawyer and Entrepreneur, Vizianagaram, Andhra Pradesh, India. Mr. Veeram Muralidhara Reddy, Kurnool, Andhra Pradesh, India. Mr. Samadhan D. Lonsune, Parvati Nivas, New IUDP Colony, Near Doordarshan Kendra, Washim, Taluka, – 444505, Maharashtra and the meeting was presided by R R Siva Kiran, Sevas Educational Society, Andhra Pradesh. Sevas Centre for Sustainable Rural Technologies also conducted second Entrepreneurs meeting held on 14th July 2016 to 16th July 2016, in the International Conference on Algal Technologies, Jalandhar, Punjab, India. This session helped in bringing together all algae experts and entrepreneurs from Northern India. Important entrepreneur members attended in the meeting includes Dr. Praveen Pathak, Entrepreneur, Mumbai Chakreshwar, Entrepreneur, Mumbai, Lakhan Yadav, Entrepreneur, Maharastra, Dr Kanchan Sandhu, KVK, Nurmahal, Jalandhar, Punjab and Mr. Dharam Pal Leel, Hon President, Rahul Budda Vihar Prabandhak Committee, Jalandhar, Punjab, India. Algae experts all over northern India have attended this conference. After conducting the above activities and after a brief interaction with many organisations, researchers and entrepreneurs, it is understood that there are a lot of problems related to Research, Technology Development, Quality Maintainance at Large Scale, Distribution and Marketability in India. Even though research in the area of Spirulina, started in India before 30 years by Dr C. V. Seshadri, Shri AMM Murugappa Chettiar Research Centre (MCRC), Taramani, Chennai - 600113, India (1979 - First Publication on Spirulina) and Dr. L.V. Venkataraman, Central Food Technological Research Institute (CFTRI), Mysore 570013, India (1984 = Publication on Spirulina), still there exists lot of problems in implementation and technology transfer. The development on Spirulina in the world was accelerated after the publication of the PhD thesis by Zarrouk C in the year 1966 with title "Influence of Various Physical and Chemical Factors on Growth and Photosynthesis of Spirulina maxima" submitted to University of Paris, Paris. During the entrepreneurs meetings (Jan 2016 and July 2016), few queries were made by the Entrepreneurs in which SCSRT could not answer. For example, How the quality of the product will be maintained at large scale, how to generate a market for these products, low-cost technology etc. Before contacting or collaborating with any organisation, Sevas Centre for Sustainable Rural Technologies initially wished to start pilot-scale testing facilities on its own with the help of interested Entrepreneurs. This process will help in monitoring the quality of the product lifecycle management practices. With the help and financial support of Entrepreneurs (Mr Linganna V of Kurnool and Mr Purushotham P of Visakhapatnam), Sevas Centre for Sustainable Rural Technologies has developed two types of technologies. The first technology is industrial grade Spirulina with pond length greater than 200 ft and next technology is village scale at less than 80 ft. For the industrial grade, Spirulina, the pond construction and technology development started in September 2016. Sevas Centre for Sustainable Rural Technologies has signed a Non-Disclosure Agreement with Mr. V. Linganna, Entrepreneur from Kurnool in the month of September. The total investment for development of this technology is about 40 Lakh. The technology development was completed in the month of October 2017. The industry name is El Shadhai Life Sciences, Kurnool, Andra Pradesh and website http://www.eslifesciences.com. The second technology was started in the month of January 2017 and completed in the month of November 2017. A non-disclosure agreement was signed with Mr. P. Purushottam, Visakhapatnam for development of this technology and it is made available from November 2017. These two technologies were monitored from the beginning for maintenance of the quality and enough scientific and research data. SCSRT wish to produce at least 500 research reports and scientific data before March 2018 for strengthening Spirulina research in India. More information about the technology will be available by sending a request email to sevaseducationalsociety@gmail.com. Come - Join with us and help advance rural development in India. Veedhanta Biotech Pvt Ltd India announces student projects and internships in collaboration with SCSRT.